Wizards of the Coast will finally let players publish custom D&D Fifth Edition content, including campaigns set in Forgotten Realms. 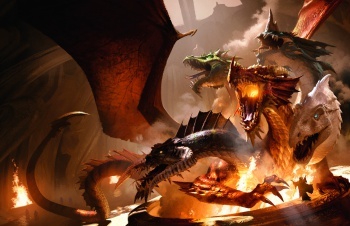 Dungeons & Dragons' Fifth Edition was a return to form for Wizards of the Coast, but if there's one thing fans missed, it was the Open Gaming License. Now content creators are in luck: Wizards has revealed not one, but two systems for publishing custom D&D content. The first is a Fifth Edition OGL, which lets you print and sell original content based on the latest D&D rules. The second is a "Dungeon Masters Guild" website where players can sell content for Forgotten Realms, D&D's official campaign setting. Originally released with D&D's Third Edition, Wizard's OGL let anyone publish content under the official d20 rules - and get paid for it. Now Wizards is repeating history with the System Reference Document 5.0, a 400-page file containing all Fifth Edition rules, classes, races, and more. Bundled into the SRD is an open license to use any of its content in your own publications. Fans were already hoping for a Fifth Edition OGL, but this Dungeon Masters Guild is a whole other beast. The platform, created in conjunction with OneBookShelf, lets anyone upload custom Forgotten Realms content which can be purchased by anyone else. Options for content range from new monsters, to NPCs, to locations, to entire Forgotten Realms adventures and campaigns. The creator can set any price on their content - or give it away for free - with the only caveat being that Wizards of the Coast and OneBookShelf take a 50% cut of the proceeds. Both announcements have huge implications for the tabletop world. The Dungeon Masters Guild alone is a big deal since it allows anyone to be paid for Forgotten Realms content - something that once required a specific contract with Wizards of the Coast. Then you have the DMSG platform itself, which has the potential to become a kind of Steam Workshop for the D&D brand. And that's not even getting into the new OGL. The last time Wizards put out an open gaming license, it spawned a tabletop renaissance that directly led to Pathfinder, Mutants & Masterminds, and countless games across multiple genres. And thanks to online distribution, the tabletop RPG market is far bigger now than the year 2000. Who knows what fantastic new games we might see powered by Dungeons & Dragons Fifth Edition ruleset?